I’ve been trying all week to get this written – and by using this title I don’t mean to raise any men vs. women / war vs. love discussions. Not even a suggestion that the two stereotypes are reversed (Mars is a desert, but perhaps still harbors life? Venus is more of the raging acid-hot hellscape). Simply, I just wanted to share two moments this week involving these two. 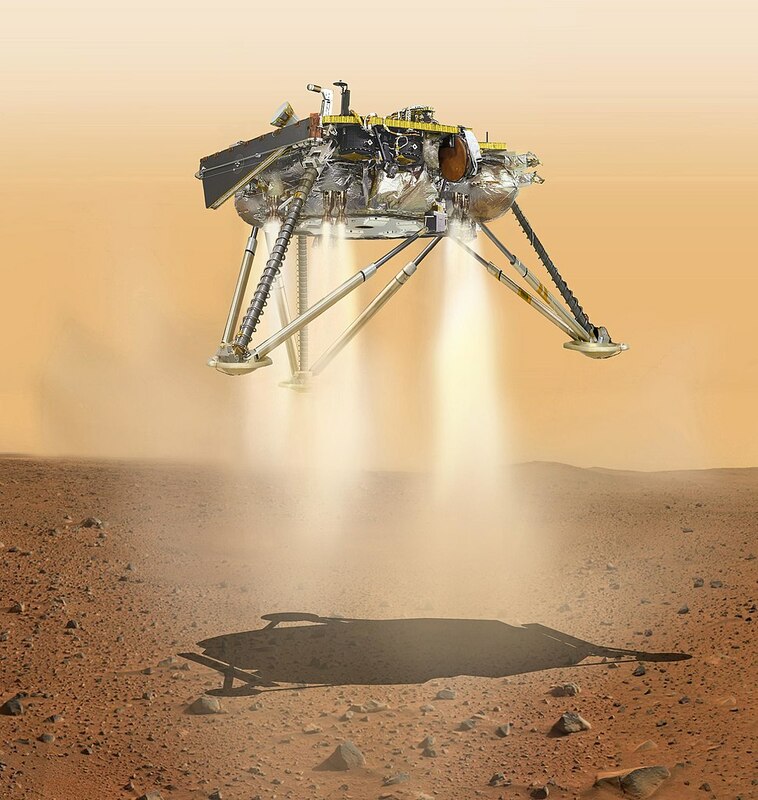 Monday, the Mars Insight lander made a successful touchdown, assisted by the shoebox-sized MarCO craft that served as communication relays during the event. On one level, this was just adding another robotic resident to the red planet – but I was fortunate enough (good timing), to log on just as Insight entered Mars’s atmosphere, and I got to follow along with the control room team at the Jet Propulsion Lab through the entire descent. MarCO cubesats monitoring and relaying data on Insight’s descent. It was riveting. Particularly in the final descent stages, as I paraphrase from memory, “…300 meters altitude… 200 meters…constant velocity… 80 METERS…. 40….” and then silence for an unsettling period of time. Finally, “…touchdown confirmed!” And the room erupted. I was right there with them, recognizing through my own experience the stress, the worry, the elation at seeing years of work, analysis, design and testing finally be released – out of sight, out of your direct control – and have everything go exactly right. It’s emotional, like watching a child leave the nest and be successful. Like everything you’ve been pouring your heart into for years actually has meaning, and was worth the commitment. Yes, it’s just a thing, some would say just another thing, doing science on a faraway planet – but that thing carries the life’s work of a lot of people. It survived the 7 minutes of terror, and can now get down to work. Not to shortchange MarCO – these little cubesats were a bit of a tagalong, but demonstrated without a doubt the utility of tiny craft in interplanetary situations. I celebrated by running around my office like a crazy person making sure everybody cared about the Insight landing as much as I did (they didn’t, but it did generate some good conversations about why landing on Mars is so hard in the first place). It was genuinely exciting to me, it got to me in a way that not much has of late. So congrats to both teams and to the entire mission. This accomplishment, like every one before it, is a huge testament to engineering, science and hard work. Thanks for sharing it! The very next morning, after all the adrenaline was gone, I was up before dawn with my kids getting ready for school. We stepped outside to a cloudless, clear sky dominated by all the winter constellations — and there high in the east was a searchlight. Impossibly bright Venus, hanging next to Spica (in Virgo). Bright enough that my son and I looked at it silently for a bit, waiting for it to move, sure that it was an aircraft landing light pointed straight at us. But no, it was a planet, the Morning Star. Just a moment shared with one of my kids, brief, almost routine. But one in which we both simultaneously were taken aback by the same surprise and awe, and enjoyed the beauty of a thing beyond our own creation. Somehow, it seemed like an appropriate combination – total overwhelming excitement on successful accomplishment by people, on Mars, counterpointed by quiet awe at the beauty of nature itself, on Venus. A reminder that both are worth celebrating, even on Earth. I enjoyed and replayed the control room video several times. I love seeing scientists excited. I definitely felt their joy. It was awesome to watch! I was more apprehensive about InSight than I expected. I guess after so many successful Mars landings, I was worried our luck was about to run out.